Innovations in dentistry have opened the doors to multiple options to achieve your dream smile. At A Plus Dental, your cosmetic dental problem can be solved through our remarkable cosmetic dentistry options. One great option is dental bonding. 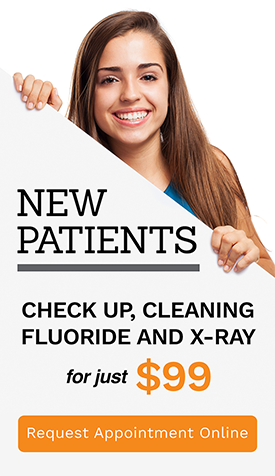 Safe and economical, this dental procedure has become a favourite among young adults. Read on to learn if this is the best option for you! For minor dental issues, dental bonding may be the right option for you! Dental bonding is attaching a tooth-coloured resin material on the surfaces of a damaged tooth to correct minor imperfections. Your dentist will use a tooth-coloured material that matches your natural tooth shade, so it is nearly impossible to tell it has been applied. Dental bonding only takes about 30 minutes for each tooth. The result is visible after three easy steps. A dental hygienist cleans your teeth to reveal your natural tooth shade. Your dentist will choose a shade of material that matches your tooth shade. To make the material bond properly, the surfaces of the target tooth are coarsened. A conditioning liquid is applied on the surfaces of the tooth. The resin is then applied, shaped, and smoothed into the desired result. 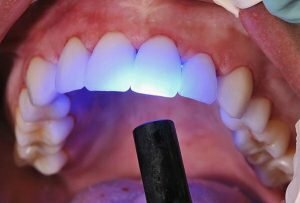 To harden the bonded material, a curing light is focused on the tooth for about 30 seconds. Once the material is hard, your dentist will evaluate the result and may trim the tooth to perfect it. You are 30 minutes away from achieving your dream smile with dental bonding at A Plus Dental. We want to help you in every way possible.